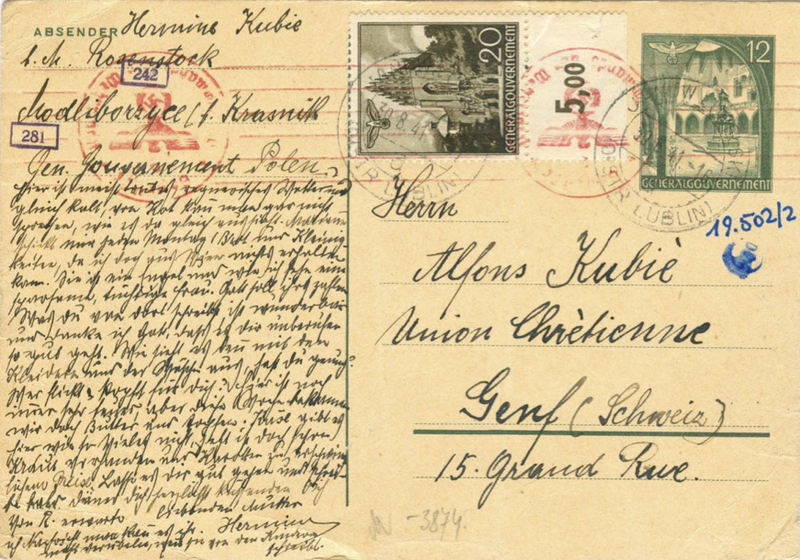 This request for help, sent by Jewish deportees in Opole to the Jewish Community in Vienna in February 1941 reflects many such letters and postcards sent from ghettoes to families, friends and aid organisations after the first transports from Vienna in February and March 1941. The letters give a rare insight into the creation of the ghettos in March/April 1941 and the harsh situation for the Jewish people living there, who without any form of income, were reliant on the help of others. All of the examples used in this post are from the collection of the Documentation Centre of the Austrian Resistance (DÖW) in Vienna. In recent decades, dozens of letters like these have been deposited by the original recipients. In Vienna, the deportation of Jews started earlier than in other parts of the German Reich: After the failed Nisko plan, in which two transports left Vienna in October 1939, the first phase of mass deportations from Vienna took place in February and March 1941. Each “transport” left from Vienna’s Aspang train station for ghettoes in the East, in occupied Poland. Each transport consisted of around 1000 Jewish men, women and children, who were unprepared for what would face them when they reached their destinations. Approximately 5000 Jews were transported from Vienna to the districts Radom and Lublin in the “General Government” into the towns Opole, Kielce, Modliborzyce, Lagów und Opatów. Baldur von Schirach, the “Reichsstatthalter” of Vienna, triggered the deportation programme to meet the request of the Viennese Nazi party to clear out Jewish flats. After five transports, the preparation for the attack on the Soviet Union took precedence over the deportation programme to make Vienna “free of Jews” and it ceased until autumn 1941. The locations of the ghettos for these first mass transportations were chosen due to their large Jewish population prior to the outbreak of war. The numbers rose as Jews from throughout Poland and the German Reich were forcibly resettled there. Upon arrival, newcomers either lodged with local Jewish residents, or were accommodated in mass quartiers located in synagogues or specially erected wooden huts. The inhabitants could move freely within the ghetto, but from mid-October 1942 leaving the ghetto became punishable by death. From November 21st, 1941, the Commandant’s Office of the Security Police and the SD (Befehlshaber der Sicherheitspolizei und des SD) in the General Government ordered Jews outside of the ghetto to be shot in case of the slightest resistance or attempt to escape. Most of the men, women and children transported in February and March 1941 fell victim to the “Auskämmaktionen” (“combing out”) of the Polish ghettos in spring and summer 1941 and were murdered in the extermination camps of Operation Reinhard. Therefore, these letters are often the last trace that can be found of them. 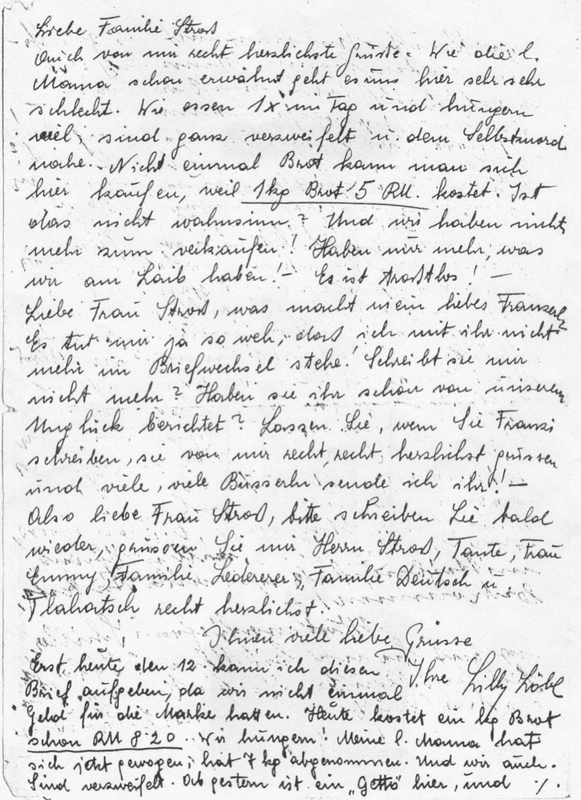 Charlotte Schönfeld wrote these lines to her boyfriend Rudi in February or March 1941 in shock by her first impressions of Opole. Charlotte Schönfeld (born on June 16th, 1922) was transported on February 15th, 1941 with the first of two transports from Vienna to Opole together with her brother Kurt and her mother Hermine. Here the traces of the Schönfeld family disappear. The Opole Ghetto was controlled by the Security Service of the Reichsführer-SS (SD), the Gendarmerie and – as mentioned in witness testimony – German army soldiers. The inhabitants of the ghetto were not provided with food or a way to earn a living for themselves. By March 1941, about 8000 Jews had been transported to the ghetto in Opole. According to the Activity Report of the Jewish Social Self-help (Tätigkeitsbericht der Jüdischen Sozialen Selbsthilfe) from February 13th, 1942, over the course of 1941 18.8% of the pre-war inhabitants, 21.4% of the deportees from Vienna and 24% of the deportees from the General Government died. 1 From May 1941, around 800 men capable of work were deployed as forced labourers in Deblin. The liquidation of the Opole Ghetto began as early as spring 1942. A transport to Belzec extermination camp left on 31st March 1942, and deportations to Sobibor followed in May and October 1942. 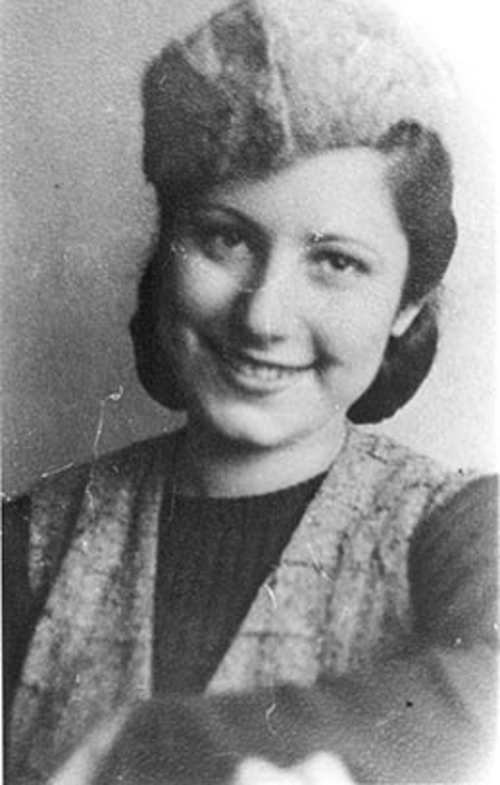 Lilly Löbl (born February 2nd, 1920), was transported to Opole on February 26th, 1941 with her brother Walter and her parents Alfred and Erwine Löbl. No further records about the fate of Löbl family can be found. 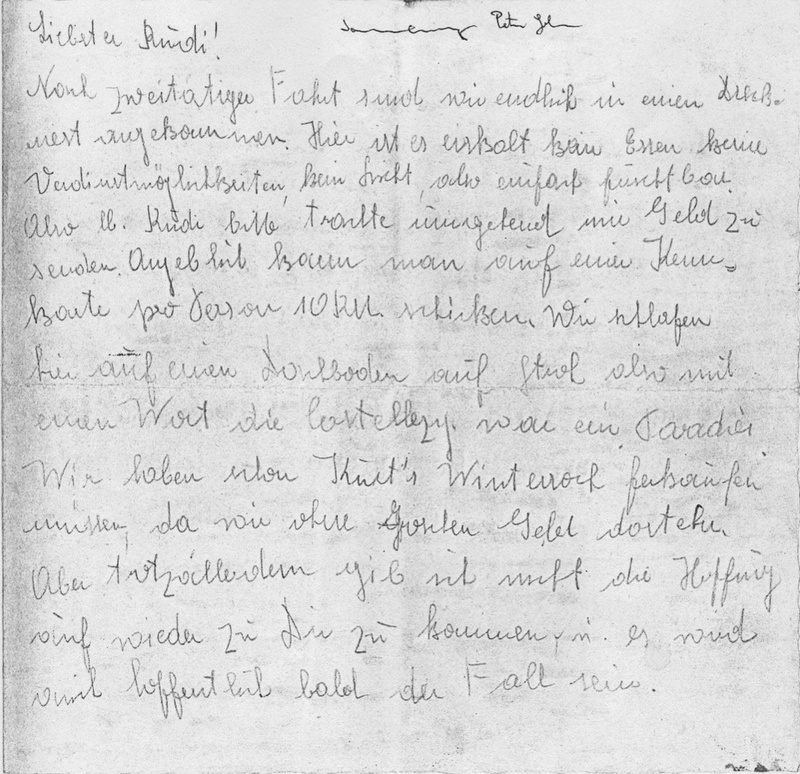 In a letter from March 12th, 1941 Lilly Löbl explains how expensive food in Opole was and describes the hunger and the disease as well as the creation of the ghetto. Of the 2003 Viennese Jews deported there, only 28 are known to have survived. On February 19th, 1941, the author of this quote, Alice Schleifer (born on June 16th, 1922) was transported from Vienna to Kielce, a town north of Cracow. Alice Schleifer was transported together with her father Eduard Schleifer and her mother Anna Schleifer, nee Kohn. While her parents were murdered, Alice Schleifer survived the war. On March 31st, the ghetto was established in Kielce. Surrounded by barbed wire, no one was allowed to leave on pain of death. By the end of 1941 about 27,000 Jews were living there. Men who were able to work were used as forced labourers in quarries. In the ghetto itself, cobblers, tailors and other tradesmen could carry on their trade. Between April 1941 and April 1942 about 6000 persons died of typhoid; many were shot, hanged, or starved to death. Over the course of just a few days (20th-24th August 1942), the whole ghetto was liquidated and about 21 000 Jews were transported to the Treblinka extermination camp and murdered. The 2000 people who remained in the ghetto, were sent to the neighbouring labour camps at Pionki, Blizyn, and Skarzysko Kamienna. The final deportation from Kielce in August 1944 brought the few remaining Jewish prisoners to Auschwitz and Buchenwald. Of the 1004 Viennese Jews transported to Kielce only 18 survived. Hermine Kubie was 71 years old when she was transported to Modliborzyce in Janów Lubelski, Lublin district on March 5th, 1941. The letters and postcards to her son Alfons – who had managed to flee to Switzerland in 1938 – give an insight into the terrible conditions she faced and the fate of other deportees. This abstract is from a letter from August 29th, 1941. Hermine Kubie’s last message is dated September 3rd, 1942, afterwards all trace of her is lost. Conditions in the Modliborzyce Ghetto were difficult from the very beginning, even if they were not comparable to those faced by later transports. A number of men who were able to work were taken to Lysakow and Jenisow labour camps, and those who remained in the ghetto tried to survive by selling their final belongings. Aside from malnutrition and disease, the behaviour of the SS and the German police, whose regular excursions into the ghetto according to witnesses’ reports repeatedly cost human lives, contributed to the high mortality rate. On October 8th, 1942, the inmates were taken to Zaklikow train station near Modliborzyce, and transported to an extermination camp as part of the “Aktion Reinhard”; according to witnesses’ reports the elderly and the infirm were murdered immediately upon arrival. Of the approximately 1000 Austrian Jews transported to Modliborzyce only 13 are known to have survived. The couple Antonie Diamant, and Adolf Diamant were transported from Vienna to Opatów on March 12th, 1941. 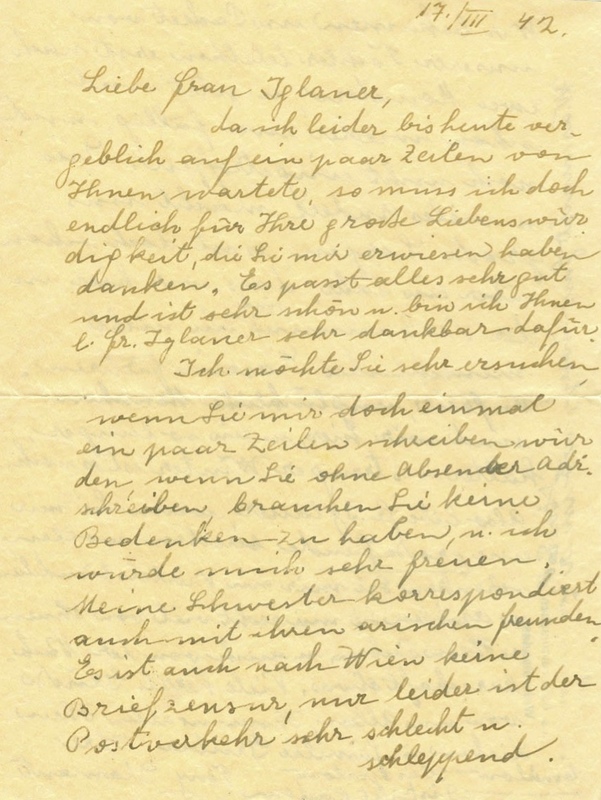 The letter, quoted above was sent from Čmielów (district Opatów) to their acquaintance Angela Iglauer in Vienna. On March 12th, 1941, 997 Jewish men, women and children were deported to Opatów and Lagów, two small towns 50 km east of Kielce. In Opatów there was no roll call and families were not separated. The number of ghetto inhabitants rose constantly and by September 1942 around 7000 were living there. Many ghetto inmates died of malnutrition and typhoid. Beginning in July 1941, the German police began to send young Jews who were capable of work to labour camps. They were used as forced labourers to build roads, or to work in local quarries and a motor factory. During the liquidation of the Opatów Ghetto which took place 20th-22nd October 1942, the German police surrounded the ghetto, together with Ukrainian guards and 6000 inhabitants of the ghetto were loaded onto railway wagons and deported to Treblinka, while 500-600 Jews were taken to Sandomierz Labour Camp. Several hundred people were shot in the ghetto during the carrying out of this “programme”. A few Jews remained after the liquidation, to clean the ghetto and to sort the personal possessions which had been left behind. They were later shot in the ghetto graveyard. The conditions, life and events in Lagów corresponded in all probability with those in Opatów, but because of the inadequate state of the sources, no more precise information is possible. Of the 997 Austrian Jews transported to Opatów and Lagow, there are only 11 known survivors who could be identified. 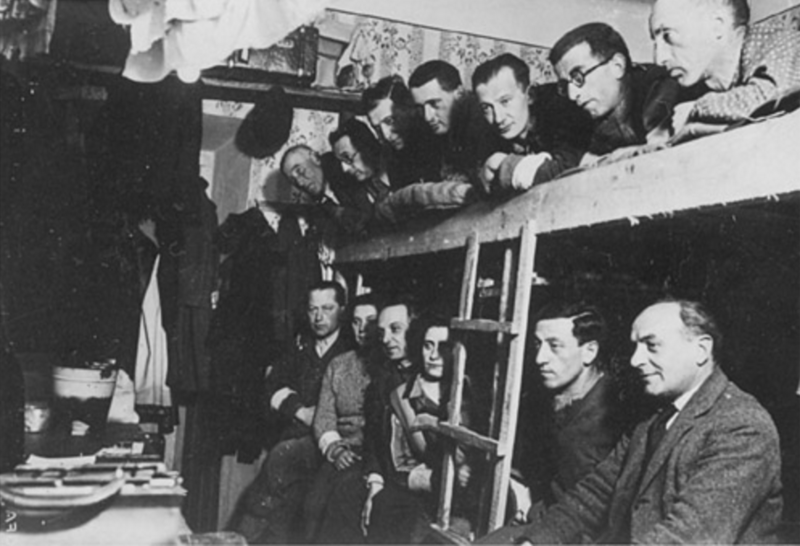 The letters and postcards sent by the deportees on the early Viennese transports in February and March 1941 show the harsh living conditions in the ghettos: cold, hunger, cramped accommodation, lack of hygiene and the spread of disease were a part of daily life in the ghettos and led to high mortality rates, especially amongst the sick and the elderly. The letters therefore differ very much to the highly controlled and supervised correspondence in later ghettos, such as Theresienstadt. Addressed to friends and family members, the letters also plea for help to the outside world. This is also the reason why the correspondence is not part of a single collection at the DÖW, instead becoming part of various collections over time from the individual recipients. In some cases it is a singular postcard, in others numerous letters. The DÖW created an online exhibition in German, including letters from the ghettos in Kielce, Modliborzyce and Lagow/Opatów, from the different collections to tell the story of these almost forgotten transports from Vienna to the “General Government” in February and March 1941.